MirrorMask (Illustrated book -- Children's edition -- Ages 10 & Up)). 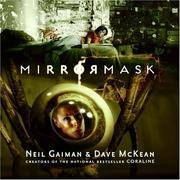 By Gaiman, Neil; McKean, Dave. New York: HarperCollins, 2005. First Edition, First Printing Hardcover FINE in AS NEW DJ Square 12mo (7-1/4 x 7-1/4), 80 pp (Unpaginated). Hardbound book is FINE -- Unread and unmarked except for remainder mark on bottom page block -- in AS NEW pictorial DJ. (h) Charming novelistic version of the film script using the same drawings as used for animation. Hard cover is black with silver graphics on cover and title/authors in silver on spine. New York: Grosset & Dunlap . Reprint Cloth Very Good in Very Good DJ Small 8vo (5 x 7-1/2), 153 pp. Hardbound book, VG in VG DJ protected in mylar. DJ is VG but with a 1" piece missing at bottom of spine, some chips, a few small tears with no paper missing. Cover is red cloth with black type and illustration. Originally printed in 1918 by Platt & Nourse, reprinted without date by Grosset & Dunlap.This was second in the Little Washingtons Series by the author of the Polly Brewster Books. Four different illustrations for two endpapers and two inside covers are what some call "from an innocent age," meaning racist with a funny little black boy as a secondary figure in three illustrations, serving food in one, barefoot in Indian feather headdress in a second and being stung by a swarm of bees in another. It was definitely another era.